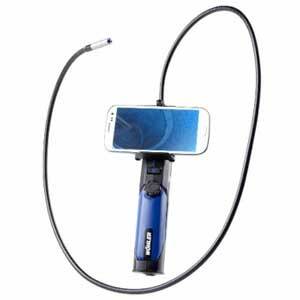 Use the 0.33-in.-diameter Wohler VE200 Video Endoscope with 4-ft. probe to inspect roof insulation, exhaust pipes, sinks, fireplaces, wall cavities and other difficult-to-access areas. Transmit images or video via Wi-Fi on a laptop, tablet, PC or smartphone (not compatible with Windows phones). Download the application from Google Play or the App Store. The unit includes batteries and a carrying case.